A decade ago the idea of printing 3-dimensional objects seemed almost like science fiction.Today, you can make this amazing concept become a reality for a few hundred bucks and a square foot of desk space. 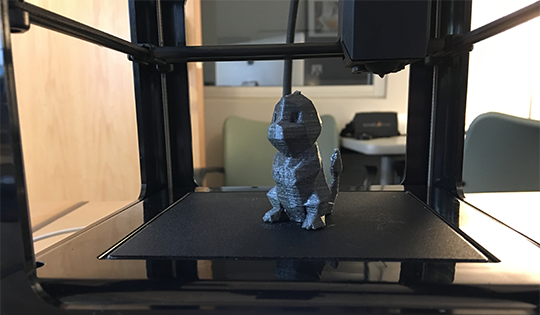 The New Media Institute jumped on this cool tech opportunity by adopting the Micro3D printer into the NMI family! Thus far, it’s been quite entertaining and useful printing everything from chord wraps and organizers, to Pokemon and Darth Vader. However, it will be truly fascinating to see how this semester’s Capstone students take this printer and bridge the gap between the digital and physical gaming worlds. Stay tuned because exciting things are sure to come!